In a large saute pan, heat the olive oil over medium-high heat until hot. Add the jalapeños and the garlic and cook for a couple minutes, until they have softened a bit. Add the black peppercorns, oregano, allspice, bay leaves and salt and stir for a couple seconds. Incorporate the red onions, stir, let them soften for a minute. Carefully pour in the vinegars. Mix the onions with the rest of the ingredients in the pan, stir for a couple seconds and turn off the heat. Cook the potatoes in a pot with salted boiling water, for about 12 minutes, until a fork or the tip of a knife goes into the potato. Strain the potatoes and place them in a bowl. Stir in the pickled onion mix. 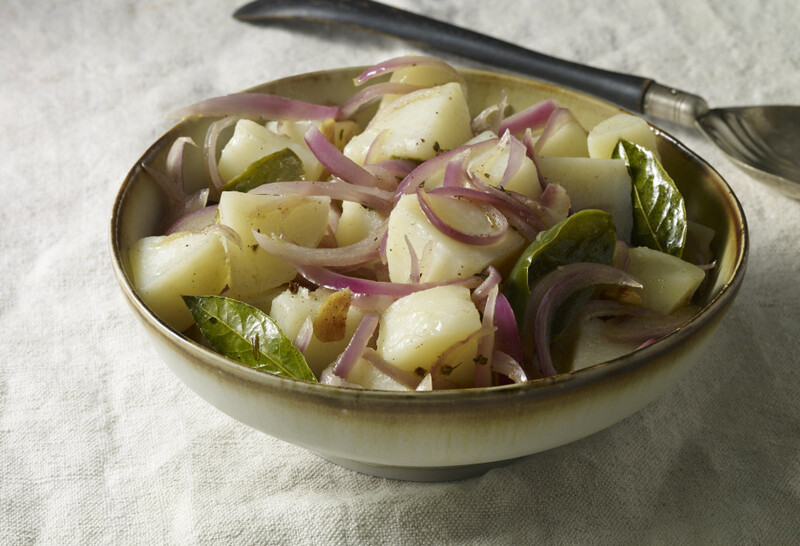 If you do so while the potatoes are still hot, they will absorb the pickle juices much better. You may eat the salad warm or cold. You can let it cool and place in a container with a cover. It will keep in the refrigerator for up to 5 days.